PETER RABBIT'S intentions were of the best. Once safely away from that lonesome part of the Green Forest where was the home of Redtail the Hawk, he intended to go straight back to the dear Old Briar-patch. But he was not halfway there when from another direction in the Green Forest there came a sound that caused him to stop short and quite forget all about home. It was a sound very like distant thunder. It began slowly at first and then went faster and faster. Boom—Boom—Boom—Boom-Boom-Boom Boo-Boo-B-B-B-B-b-b-b-b-boom! It was like the long roll on a bass drum. Peter laughed right out. 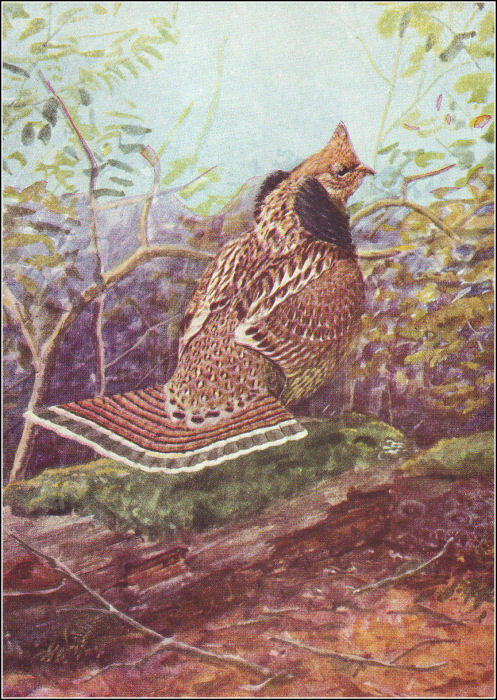 "That's Strutter the Ruffed Grouse!" he cried joyously. "I had forgotten all about him. I certainly must go over and pay him a call and find out where Mrs. Grouse is. My, how Strutter can drum!" The black ruff around his neck gives him his name. "Is—is—Mrs. Creaker dressed as handsomely as you are?" asked Peter rather timidly. "I'm glad to hear you say it," declared Peter, nodding his head with approval quite as if he was himself the best of fathers, which he isn't at all. "May I ask you a very personal question, Creaker?" Creaker's yellow eyes began to twinkle. "That is a very personal question," said he. "I won't go so far as to say I steal eggs, but I've found that eggs are very good for my constitution and if I find a nest with nobody around I sometimes help myself to the eggs. You see the owner might not come back and then those eggs would spoil, and that would be a pity."